Welcome to Wheels-2-Go!, we're in the heart of the Florida Keys, 1/2 way between Key Largo and Key West. 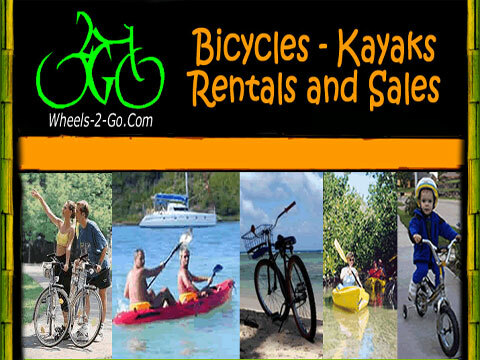 We are Marathon Florida's only spot for Kayak Rentals and Bike Rentals. We are also Marathon's only U-Haul Dealer. Our business is located in the heart of Marathon, South of the Airport and across the street from McDonald's. Weâ€™ll give you a detailed island map and set you free to explore everything from Iguanas, Dolphins and secret beaches, to snorkeling, diving and our islands dining and drinking hot spots. Wheels-2-go" is a friendly little shop nestled in the heart of the Florida Keys. We love it here and want you to love your time here! We rent Kayaks & Bike. We also sell Kayaks & Bikes. We're the only Small Engine Reair Shop in town. We are also the only U-Haul dealer in town. Plus we sell and service Baccio Scooters. Try us you'll like us! We treat visitors as locals and locals as guests.